Eastern Libyan forces bogged down in street battles in a push to seize the capital Tripoli deployed warplanes on Friday to hit several government positions, as more civilians fled fighting. More than 1,000 people gathered in central Tripoli to demand that Khalifa Haftar stop the advance of his Libyan National Army (LNA) on the coastal city of about 1.2 million people. 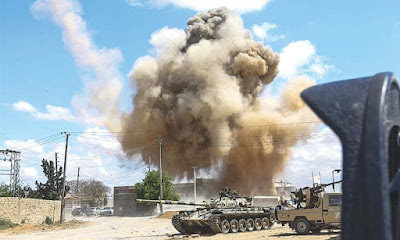 But forces loyal to Prime Minister Fayez al-Serraj’s internationally recognised government have so far kept them at bay, with fierce fighting round a disused former airport about 11 km (7 miles) from the centre. A week of battles has killed 75 people — mainly fighters but also 17 civilians — and wounded another 323, according to latest UN tallies. Some 9,500 people have also been forced out of their homes. But Serraj’s government has managed to halt for now the advance, helped by forces with machine-guns on pickups and steel containers across the road into Tripoli. The Tripoli government says it has taken nearly 200 prisoners from Haftar’s forces.